The Virgin Mary also an angel appears to Bernardo Martinez in 1980 in a small town in Nicaragua, as well. The first appearance was on May 8. The apparitions were recognized in 1982 by the Bishop and the Nicaraguan bishops' conference, and the place of the apparitions is National Shrine and was indulgences during the Jubilee Year 2000. San Francisco Cuapa is a small town in Nicaragua Chontales, 125 kms. east of Managua, the nation's capital. The word "Cuapa" is derived from "coatl bread" in the indigenous Nahuatl language means "above the snake." Christian this name makes you think of the Immaculate Conception, patroness of Nicaragua, who crushes the serpent's head. Bernardo Martinez was born in Cuapa, Nicaragua in 1931. His grandmother raised him and educated Christian. It was a simple and humble, pious and helpful farmer who liked to help in the church as sexton . From very young Bernardo wanted to be a priest, but he could not do in his youth. After the apparitions, for a most precious gift of the Holy Virgin, Bernardo, at 64 years old, was ordained a priest in the Cathedral of León, Nicaragua, in 1995. Holy priest dies in 2000 and Mass of Resurrection in the same cathedral is celebrated. Bernardo told the Priest Jorge Rodriguez in the seminar which is being held warning him that he could not reveal everything MARY said, that when the Bishop of Juigalpa, Bishop Pablo Antonio Vega, authorized him to reveal the miracle and crowds of pilgrims started to come to Cuapa, three officials of the Sandinista regime came to see, to provide you, free, a farm of good land, with cattle. Condition: Virgin say Sandinista era . Bernardo explained that he could not truthfully. they traded, it was enough to omit anti-Sandinista. Bernardo replied: "I can not betray" . then, the official journals as Barricade and began a television Sandinista being mad, hysterical and deluded campaign. A woman named Sandra, began to haunt him and whisper in his ear and desires: "I want to see you at midnight." Catholics who protected Bernardo discovered lurking photographers. Sandinista One morning police raided his house and tried to kidnap him. But devotees who slept in the house of Bernardo, they clashed. 's Church for safekeeping, brought Bernardo Seminary where he devoted himself to gardening and delighted in his stories seminarians. The first appearance on May 8, 1980 occurs. Bernardo decided to go fishing on the river, way back with their catch, leaned to a tree to pray. At three p.m. see lightning and not knowing where came, walked about six steps and saw another flash, then began to see the image of the Virgin of the Assumption, known in Nicaragua as the Immaculate Conception or Immaculate. Bernardo that "the whitest cloud was ... faced glow in every direction, rays of light like the sun. Above the cloud were the feet of a beautiful lady. The had bare feet. The dress was white and long. He had a blue ribbon at the waist. Long Sleeved. The mantle covered a pale cream color with gold embroidery on the shore. The hand was clasped over his chest. " Then I said: "How can you call?." She replied with a sweet voice called Mary. I saw his lips move. Then I said: It's alive!. Spoke!. He has answered my question. I wonder, then, that where he came from. I said very gently: "I come from heaven. I am the mother of Jesus " , and I immediately wonder-remembering what the priest had told me- "What do you want?" . She said, "I want you to pray the Rosary every day," "I do not want you to pray only in the month of May. I want you to pray constantly, family ... from children who are using right ... you pray in a fixed time when there are no problems with the housework. " She explained that the Lord does not like the prayers we do lightly or mechanically. So we recommended the rosary with reading Scripture quotations and put into practice the word of God. He continued: "Love: Discharge your duties. Make Peace. Do not ask the Lord for peace if you do not there will be NO peace "
Then he said: "I Renew the Five First Saturdays. Received thank you very much when you did " . before the war we did it-we communed confesábamos and every first Saturday of the month, but as the Lord had delivered us there was bloodshed in Cuapa no longer continue with this practice. Then he said, "Nicaragua has suffered much from the earthquake. It is threatened to suffer even more. They will continue to suffer unless you change and then short pause he said: "Pray, my son, the Rosary worldwide. Tell believers and non-believers that the world is serious dangers lurk. Ask the Lord to appease His justice, but if you do not change, the coming of abbreviated WWIII ". After saying these words I realized I had to say to the people and said, "Lady, I do not want to have many problems in the Church. Tell someone else. " Then she said, "No, because the Lord has chosen you to give you the message." Bernardo preferred to keep everything secret. Eight days later when he went in search of a calf, sought another way other than the onset. After walking for a while, saw a flash and felt the joy of the first time, then came another flash and then saw the Virgin. She told him amiably but claim: "Why did not you say what you said you sent?" . And Bernardo replied: "It is I'm afraid. I'm afraid of being laughed at me " . And then Our Lady said: "Do not be afraid. I'm going to help, tell the priest " . There was another flash and then disappeared. On June 8, Bernardo was the site of the apparitions, more nothing happened. But at night he had a dream in which I saw the Virgin in the place of the apparitions. Bernardo I Account: It was like day. I was in the place where I first saw it. I prayed the rosary. At the end I saw two flashes again and she provided. In the dream, I said, "What do you want, mother?" . And then I said I had some orders, because people charge me things. He replied saying, "Some are going to do, others do not." Then she pointed to an area of the sky and there appeared, as in film, a crowd of people with glistening dresses. He describes it thus: "I looked at a group of people, who, dressed in white walking toward the rising sun. Sang. I could hear, but not understand the words. They had a joy I had ever seen " . Then came another group, and the Virgin said: "Look. These are the first communities where Christianity began. They are the first catechumens. Many of them were martyred. They want you to be martyrs?. How about you be a martyr? ". Bernardo is telling: " I did not know what that meant but I said yes. Then I saw another group dressed in white with bright beads in hands. They looked in prayer, praying the Our Father and ten Hail Marys. I prayed with them. Then I saw a third group, all dressed in brown. " After having prayed said the Lady . "These were the string of the first hand"
Wine a fourth group, but these came dressed as we dress. I suddenly felt that I could get into this group, because I dressed like. But I looked down at my hands and I saw black, they, instead, as above gave off light. then said, "Lady with these I go because they are dressed like me." She said, "No, you still lack, you have that tell people what you have seen and heard. I have shown the glory of the Lord, and this will acquire if you obey the Lord, the word of the Lord, if they persevere in the recitation of the Rosary and put into practice the word of the Lord. " 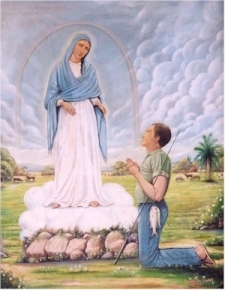 For the appearance that corresponded to 8 July the Virgin did not come to the place of the apparitions, but Bernardo had a dream that has to do with requests and orders people made him. In the dream, Bernardo sees an angel and he tells her that the prayer he had made, in the place of where the Virgin appeared and failed, had been heard.
. Among the requests of many, was that of a lady who had a brother in jail, wrongly accused, and the angel brought a message to them The angel said, "Go and tell the prisoner's sister is very sad, that advised not to sign a document, they're going to push for the firm liable for money, he is innocent. That she did not grieve, you will be able to talk to him alone, they're going to deal with kindness. I go on Monday Juigalpa command to take all steps to remove it, because that day they will give. Carrying thousand Cordoba because they are going to recover the fine. " I also told the angel who had two recommendations for the Blessed Virgin a premium and "told him that it was problems at home by vice dad and brother and problems at work" . No details entered. The angel answered and said: "Let the people around them have patience with them, they do not claim them anything when they are drunk" . Then he added: "Go and tell them not to continue with this vice, do so slowly and so will removing the desire". Then he said that his cousin was to warn that they were going to steal, they were going to rob, they would throw in a foot wounding his left heel and later, they would kill him, then heard this, he was so frightened that said to the angel: "Can not is against that judgment to revoke my cousin many rosaries praying?" . He replied: "No. That is going to die, but you can prolong the life if he takes the advice. " Then he said to his cousin: "Do not be afraid. To stand firm where he is. Do not leave the job because as a teacher who has faith in the Lord can do much good to men. " He continued: "Do not turn your back on the problems and do not curse anyone." Bernardo, awake from sleep, did as the angel commanded. Everything went as the angel had said. In August there was no appearance until September. Bernardo was accompanied by many people, the place of occurrence, and as usual, the second saw the Lady Lightning, only this time the girl saw. Bernardo described it: "She was beautiful, but girl. It was small, wore a pale cream tunic. I had no veil, no crown, nor robe. No embellishment or embroidery. The dress was long, long sleeves and was girded with brushed lace at the waist. Her hair fell to her shoulders and was brown. The eyes too, although lighter, almost honey. All she radiated light. It looked like the Lady, but was a little girl. It was like an eight year old girl. " Then Bernardo said: "Be seen for everyone creates. These people who are here want to meet you " , but after listening said, "No. Simply give them the message you because you will not believe me but look not believe. " Then I no longer insisted more with her being allowed to see, but I spoke of the temple that people wanted to do to honor her. Father Dominic said that he could not decide which we told the Blessed Virgin. That was how he asked this question. Because a man had given us Matagalpa and C $ 80.00 cordobas for this purpose. She replies saying: "No. The Lord does not want material temples. Want the living temples you are. Restore the sacred temple of the Lord. In you is the Lord well pleased. " He continued, "Love. Love one another. Forgive. Make Peace. Do not just ask. Make it ". I said I did pegunté with C $ 80.00 Cordobas he had in his hands. I was thinking if I should return them. I said I would for the construction of the chapel Cuapa. He added, "From now on do not take a dime for anything." Then he told me not to say "church" to the material that the church and the temples us; those are chapels or prayer houses. I had thought of asking my question because I did not know whether to continue in the catechumenate. . Did to see that advised me She said, "No. Do not go. Always remains steadfast in the catechumenate. Gradually you'll all understand what the catechumenate. In the community meditate away from the hustle Beatitudes. " Then he added: "I will not go back on October 8, but 13." And I lift the cloud. It was 3 pm on Oct. 13 when suddenly a large bright circle was formed in the earth. All without exception, see it, as a ray falling and this bright circle marked on the ground. The light came from above. I looked down and saw the Lady. This time the cloud was about flowers that had taken on the cloud and feet of the Lady. Bellisima!. She spread her hands and rays of light reached us all. I saw the lady with outstretched arms and told people: "Mirenla! There it is ". She said, "No. Not everyone can see me " . I said back to the people: "The Lady is in the pile of stones on the flowers" . Then I said to the lady: "Madam, you look like to believe! because many do not believe. I say to my the Devil appears to me. And the virgin's dead and gutted as any mortal. You see, Madam ". She did not answer me. He clutched his chest in attitude as the image of the Dolorosa and how that image has made the pale face, the mantle change to a gray color, made the sad face and cry. I cried too. I trembled as seeing her and said, "Madam, forgive me for what I said I'm guilty!.!. Excuse me! ". then answered me saying: "I'm not angry and I'm angry." We ask, I: "And for crying?. . Crying I see " She said "I'm sad the hardness of heart of those people. But you got to make prayer for them to change. " As I continued crying, She gave the message: "Pray the Rosary, meditate the mysteries. Hear the word of God in them that. Love one another. Love one another. Forgive. Make Peace. Do not ask for peace without making it because if they do not make no use on their request. Fulfill their duties. Put into practice the word of God. Seek to please God. Serve the neighbor so he likes. " When I finish give the message, I remembered the advice of people Cuapa. I said, "Lady, I have many recommendations. You, lady, knows everything " . Then she said: "I ask little things. Faith Pray for strength to carry his cross each. The sufferings of this world are not removable. The suffering is the cross you have to carry. Life is so. There are problems with the husband, the wife, children, brothers and sisters. Talk, schmooze to solve problems peacefully. Do not go to violence. Never go to violence. Ask for faith to be patient. " Then he said: "Now you will not see me over here." I thought definitely would not see more and I yelled: "Do not leave us, my Mother". then said: "No I grieve. I am with you but do not look. I am the Mother of all you sinners. Love one another. Pendonéense. Make peace because if you do not make no peace. Do not go to violence. Never go to violence. Nicaragua has suffered much from the earthquake and will continue to suffer unless you change. If you change not abridged the coming of World War III. Pray, pray, my son, in all the world. The world is currently facing grave dangers. A mother never forgets her children. And I have not forgotten what you suffer. I am the Mother of all you sinners. Invóquenme with these words: Blessed Mother, you are my Mother, the Mother of us all sinners. " The message of Our Lady of Cuapa is profoundly biblical and corresponds to the sound doctrine of the Church. Hagan peace you, if you do not will not be peace. The message Cuapa helps deepen devotion to the Virgin Mary on a biblical and Christological foundation and understands our Mother Church. The main points of the message is: Pray the Rosary every day. Family. A quiet hour. . Meditating the mysteries . Pray faith, patience, strength to carry the cross . Removes the devotion of the First Saturdays . Meditate on the Beatitudes . Love one another and forgive you Make peace, not content with asking. If you do not do, there will be no peace. Discuss among yourselves entiéndanse, and never go to violence. Nicaragua has suffered much, and will continue to suffer unless you change. was not grieve: I am with you but not see me. A mother never forgets her children. Invóquenme with these words: "BLESSED VIRGIN, you are my Mother, the Mother of us all sinners." The first signs of occurrences begin to happen on April 15, 1980 in the church of Cuapa where Bernardo was sacristan. When he came to the sacristy is the image of the Virgin all lit. The Bernardo himself relates: "I thought that the boys were playing in the square had broken tiles and so was coming over the image clarity. I walked, to see and saw that there was no hole in the roof, went out to see if the windows light came outside and saw nothing, I went around the image to see if he had put a phosphorescent rosary, look, the hands, feet, neck ... It was not anything like that. The light did not come out of nothing, the light coming out of it. With the light she gave one could walk without stumbling. And it was night, nearly eight in the night because he had been late. " Since then miracles start happening in the heart of the humble farmer. He previously tended to anger, by his own testimony, and fought with people when something was not right, now remained silent.